Thursday, January 12, 2012 from 6 - 8 p.m.
Jay Wilson: "Yes. Yes. Try Less." "This show of recent work consists of both labour-intensive toothpick pieces as well as graphic, colour-field, wall-mounted foam and aluminum abstractions. The work is at once obsessively detailed while being approachable in both colour and materialiality. The toothpick works depict herds of elk with typographic declarations held high in their antlers that vaguely announce sentiments such as Above All Else and Reckless Abandon, spelled out with twigs and safety matches respectively. For me, these declarations are not only words to heed but also evocations of both optimism and hope in a non-hierachical battle of suggestion vs. meaning. Contradictions abound in the exhibition. Hand-pencil-crayon-coloured toothpick elk pairs read YesYes, or Try Less, while assuming push-me-pull-you configurations. 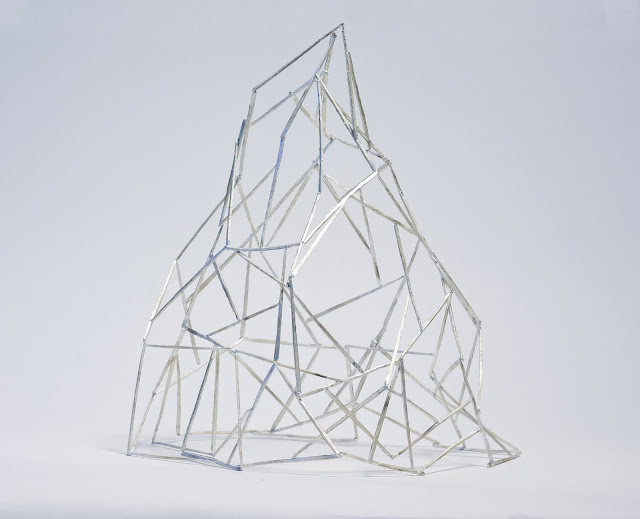 Ordinary toothpicks are re-envisioned as cast sterling silver toothpick structures; one a Tatlin-esque sketch, the other a facetted mountain. The pieces speak of a process that is both highly structured and the developmentally random. Other works entitled Patternpattern are inclusive collisions of pattern and colour. A decade ago, I saved orange peels that I had peeled all in one piece, the results of which have been enlarged and laser cut in aluminum. Each silhouette is mapped with colourful sheets of craft foam. The resulting topographies resemble islands but more importantly to me, are simple, almost gestural declarations of two structures overlapping and informing one another." Jay Wilson is an artist/educator from Toronto, Canada. He is a full-time professor of Design in Art and Art History, a joint program between Sheridan College and the University of Toronto, Mississauga. He has shown both internationally and locally and served on the Board of Mercer Union, Toronto and Oakville Galleries, Oakville. He was the inaugural recipient of the Toronto Friends of the Visual Arts Artist Prize. He would like to acknowledge the support of Toronto Arts Council and the Ontario Arts Council. Jay Wilson is represented by KWT contemporary. 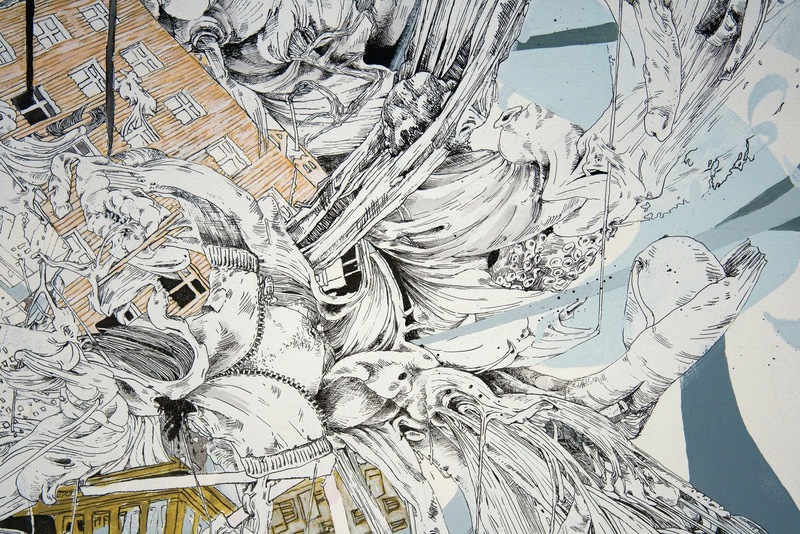 Dagmara Genda, "Palace with Apartments", 2012 (detail). ink and acrylic on paper, 29.5" x 73"
"Tracing Tomorrow is the latest iteration of my interest in the production of space and identity. I explore these notions through tracing lines to make new territories, surfaces, definitions and objects. I'm interested in one line in particular, the historically problematic and shifting division between East and West. I make use of this blurry division by tracing Soviet architecture that bears an uncanny resemblance to American capitalist buildings. These structures, so pregnant with the promise of a better tomorrow in their time, are drawn together to form perversely patterned spaces that lack a centre of gravity. Yesterday's future and how it might leave us wanting today, is a common idea in post-communist and Eastern European scholarship. A post-communist world is often described as a terrain of broken promises, nostalgia, competing narratives and instability. Increasingly this description applies to the so-called Western world. The global financial crisis, coupled with environmental crises and the persistence of war, has not only fuelled doubt in a system that was to mark the "end of history" but has brought up the question of what sort of system, what kind of tomorrow, awaits us? Tracing Tomorrow tries to delineate, through a literal act of tracing, what the future might look like but not as a futuristic, identifiable territory. Instead it highlights the problem of producing a totalizing vision of a future space. This act of delineation is the main problem I wish to address in my drawings. To delineate is to define, to mark a territory or to create a space-how we do so is informed by a myriad of factors. My drawings are made from a complex system of tracing that starts from traced architecture and ends with traced paint strokes. Forms weave in and out of each other, mixing foreground and background, delineating features and dissolving into nothingness. The way we identify things is tentative, always hovering at the edge of non-existence. This formal aspect of the drawings is a way for me to find new ways of identifying what we see while also pointing our attention to the very contingency of our sightlines." Dagmara Genda was born in 1981 in Koszalin, Poland, and now lives and works in Saskatoon, Saskatchewan. She holds an M.F.A. from the University of Western Ontario. In addition to her studio practise, Genda is active as an arts writer and is Director at AKA Gallery, an artist-run centre in Saskatoon. Genda has received many awards and honours, including most recently, the 3rd Ward Artist in Residence, Brooklyn, NY (2011). Dagmara Genda is represented by KWT contemporary.